British indie-rock group Bloc Party has ended its “indefinite hiatus” by dropping a new single called “The Love Within,” which will appear on its upcoming fifth album, Rolling Stone reports. After releasing its previous LP—aptly titled Four—in 2012, the band took some time off for the second time in six years, with guitarist Russell Lissack citing“rollercoaster” relationships between bandmates as one of the reasons for the break. 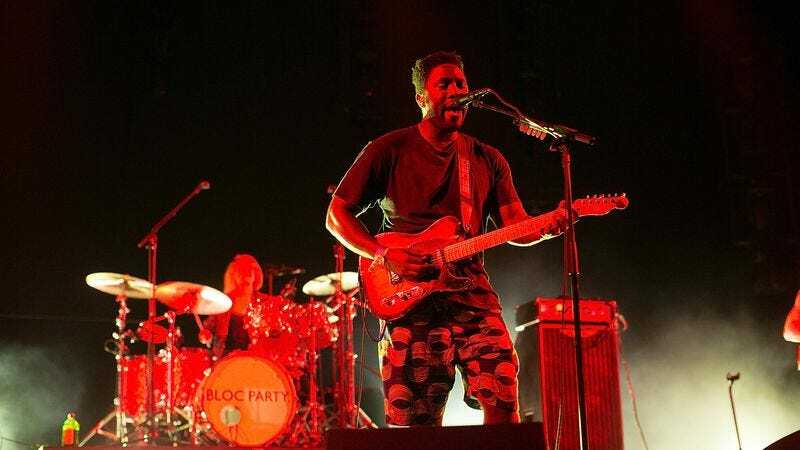 And sure enough, Bloc Party has re-emerged with a different lineup: longtime bassist Gordon Moakes has left the band, with Menomena bassist Justin Harris taking the reins. Drummer Louise Bartle also officially joined the band earlier this year, replacing Matt Tong, who decamped in 2013. Frontman Kele Okereke says the new LP—which is either untitled or called Hymns, depending on who you trust—is “like nothing that we’ve done before.” The single, however, boasts a sparse, chilly lead-in that harkens back to the group’s debut LP Silent Alarm before busting into a synth-laden groove that wouldn’t be out of place on Bloc Party’s third album, Intimacy. Also, the first lyrics of “The Love Within” are pulled directly from “The Prayer,” a track on the band’s underappreciated second LP A Weekend In The City. So in some ways, Bloc Party’s new stuff is exactly like what it’s done before.